I'm often reminded of how little I know about food. Despite being something about which I am genuinely obsessed, it's easy to get slightly overwhelmed by the number of different cuisines left to delve into and new ingredients and flavour combinations still to try. That is, of course, all part of the fun; there's a lot to be said for that perpetual sense of discovery. With so much still to learn I'm therefore not all that surprised whenever something new enters my field of view, but every so often I do have to stop and wonder how certain things have thus far managed to pass me by. For instance, "why hasn't anyone ever told me about pasticciotto before?!" A traditional dessert of the Salento/Puglia region of Italy, pasticciotto first appeared in the mid-1700's, and are rumoured to have been developed by chefs at Pasticceria Ascalone in Galatina as a means to enhance the town's reputation among the surrounding villages. Comprising a sweet short crust pastry filled with a rich crème pâtissière, it's easy to see how they managed to win everyone over. To make the pastry, combine the flour, baking powder and zest in a large bowl and then rub in the butter and lard until the mixture resembles breadcrumbs. Add the yolks and mix until just combined (you may need to add a splash or two of milk to bring the mixture together into a smooth dough). Form the dough into a disc, cover in cling film and refrigerate for 2 hours. Prepare the pastry cream by first combining the milk, zest and vanilla (seeds scraped) in a pan, warming over low heat for a couple of minutes and then removing from the heat and leaving to infuse for 20 minutes. Return the pan to a medium heat and bring the milk to a scald. While you're waiting, whisk together the yolks and sugar until pale, then add the flours and whisk to combine. Strain the milk onto the egg mixture, whisking as you pour, then return to the pan and bring to a boil over medium-high heat, all the while whisking to prevent the custard from sticking to the base of the pan. Once the mixture is dense and has just started to boil remove from the heat, pour into a bowl, cover directly with cling film and refrigerate until cold. To assemble, on a lightly-floured surface roll some of the dough to a thickness of 8-mm and line 10 buttered baking moulds*. Place 2-4 maraschino cherries in the base of each mould, then spoon or pipe in the pastry cream. 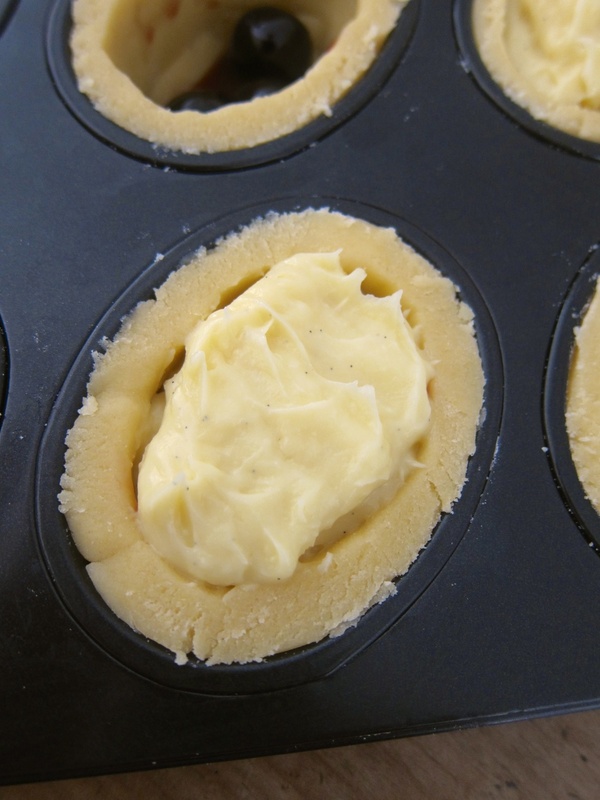 Roll out the remaining dough to 5-mm thick and lay over the filled moulds. Press around the edges to seal, creating a little mound in the centre of each pasticciotto as you do, and then trim the edges. Brush with egg wash and bake at 190°C for 25-30 minutes, until the tops are golden brown. Cool and then serve. Makes 10. ** I had trouble finding the traditional oval pasticciotto moulds so just used a friand pan, which seemed to work reasonably well.